Argos and Tesco launch sub-£100 budget tablets | What Hi-Fi? Tesco, the all-conquering high-street retailer, and Argos, purveyor of almost anything you can think of, have both released own-brand budget tablets in an effort to tempt people away from established offerings from Amazon, Apple, Google and Microsoft. 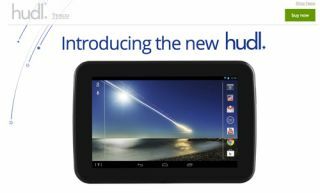 Tesco was the first out of the blocks, releasing the Hudl tablet for a wallet-friendly £119. Featuring a 7-inch, 1440 x 900 HD screen, Android 4.2.2 OS and a 1.5GHz Quad-core processor with 1GB RAM, the Hudl has a decent spec sheet, good enough to tempt any first-time tablet buyer. The Hudl comes packing a 16GB internal storage and, crucially, expandable storage via microSD for up to 48GB extra. This is something which the iPad Mini, Nexus 7 and Amazon Kindle Fire HD all lack, preferring to push users towards cloud storage. The Hudl's battery life is rated at approximately 9 hours, which is on par with the Nexus 7, but less than the Apple and Amazon tablets. Unsurprisingly, the Tesco Hudl takes full advantage of Tesco's Blinkbox TV and movie streaming service, and also has a dedicated Tesco app that also allows you to order groceries and browse the company's F+F clothing range. Despite the decent spec, it may well not appeal to serious users but is easy to see the appeal to those simply wanting an affordable, workmanlike tablet, possibly for kids. But if you want the cheapest tablet, look no further than Argos. The store has taken the term 'budget' to a new level, unveiling the MyTablet for a mere £100 and taking a right hook to Tesco in the process. However, the Argos MyTablet is definitely a case of 'getting what you pay for'. The MyTablet has a 1.6GHz dual-core processor, 7-inch 1024x600 display and 8GB internal storage, expandable up to 32GB. Android 4.2.2 shows its face again and the tablet comes pre-loaded with BBC iPlayer, Angry Birds, Facebook, Twitter and an e-Book reader app. Available in pink or silver metal finishes the MyTablet is likely to be aimed at a younger audience who want a large screen to play games on, without the worry of potentially damaging a premium product. The Tesco Hudl and Argos MyTablet are on sale now.